In November following the completion of our 2012 Lean Japan Tour I was fortunate to attend the 40th Anniversary of the establishment of the Australian and New Zealand Chamber of Commerce in Japan. It was an enjoyable night in Tokyo’s beautiful Peninsula Hotel, with the Australian Food and Beverage Manager treating guests to a superb meal, and singer Sarah Àlainn entertaining us early in the night with a number of songs from her recent debut album. Sam then turned to his own background with Japan and Rio Tinto’s iron ore business. To my pleasant surprise Sam focused his talk on his 20-year experience in the automotive industry and how lessons learned from lean manufacturing have been critical to Rio Tinto’s mining operations. Sam began by addressing the seemingly unrelated industries of automotive manufacturing and large-scale mineral resource extraction. To the uninitiated, the two industries might seem worlds apart. One manufactures highly engineered, precision vehicle components to exacting specifications. It’s an extremely competitive industry. It requires complex, hugely sophisticated and wherever possible automated plant and equipment. It demands first rate forecasting and scheduling, tight inventory and costs control and a keen customer focus. It depends upon top-flight engineering, electronics and technical expertise and lean, high performance business practices. The other? It’s just digging big holes and scooping the dirt into trucks isn’t it? Well, no, it isn’t, not by any means. The holes are not big, they are gigantic. So are the shovels, trucks, plants, trains, loaders and ships. Sam impressed upon the audience the scale of Rio Tinto’s operations and the modernity, complexity, technological sophistication and similarity to other complex production processes such as automotive production. If I had to name one thing I have transitioned from what the automotive industry taught me across to what Rio’s mining operations are doing today, it would be an intense, laser-like focus on value and efficiency. Many of us are familiar with the systems that fall under the banner of ‘Lean Six Sigma’. Pioneered by companies like Toyota and General Electric, they are far from confined to any particular industry or process. At base level it represents a concentrated intent to eliminate variation or waste at every stage of production. Sam went on to address a question that is often asked by industries unrelated to automotive production, and is not immediately obvious to those not experienced in the fundametals that drive lean manufacturing. But, you might ask, what does operating a collection of large mining pits in the Pilbara have in common with producing precision engine components or wheel bearings? The answer is that that these approaches to process and production are about bigger and more general questions than a specific product or sector. At their heart they are about solving problems and the essential problem is the same for everyone. What is wasting our time, our labour, our workforce skills, our energy consumption, our resources and our money? How do we discover it, isolate it, analyse it and eradicate it? Sam spoke proudly of Rio Tinto’s iron ore business, and how it was not just ‘a collection of pits’. … our 14 mines far more closely resemble the component parts of a huge, highly mechanised and automated, centrally controlled factory. They operate as “one mine” and, as I said, 24/ 7, 365 days a year. We have a fleet of 300 massive haul trucks. We recently ordered 150 new ones from Komatsu- yes, they hold 350 tonnes of ore each, but they do not hold a driver. They are autonomous, run by advanced robotics, GPS and Artificial Intelligence. They learn the mine layouts as they go: loading sites, dumps sites, other vehicles and obstacles. Before they get involved of course, there has to be drilling and massive blasting – again, all remotely operated. The ore is loaded onto trains that are two and a half kilometres long. We are presently investing $520 million in fully automated, driverless trains – an unprecedented step in heavy-haul rail on anything like this scale. Around the clock activities – the drilling, the blasting, the loading, unloading, transport by train and transfer at three port terminals to Asia-bound ships – all of it is physically controlled from Perth, 1,500 km away from the Pilbara. The Perth facility is the nerve centre of the entire far-flung machine. Inside, 500 people run the whole system, with advanced electronics, communications and monitoring systems that are quite literally the state of the art. They monitor the quality of ore in a drill core sample from half a continent away in real time as the drill goes into the earth. They control the location of every one of those huge trucks and trains, but much more than that. They also monitor the engine temperature of each one, the brake wear, the oil quality, fuel consumption and a comprehensive list of other machine diagnostics, like the pit crew of a Formula 1 car. All of these variables are constantly and intensively measured and optimized in real time to ensure the absolute best possible outcomes in performance, efficiency, wear and tear, energy consumption and longevity in these very expensive pieces of machinery. I spoke with Sam later in the evening about the autonomous nature of the Komatsu haul trucks, interested partly because of my own experience in the field of optimisation and artificial intelligence, and because of our partner JMAC’s experience in working with Komatsu on automation of haul fleet. Sam reinforced that their trucks are capable of learning and optimising their own routes and operation, have the ability to avoid collisions, and operate independent of a remote human operator. Sam related that the truck operations were so precise that in optimising their routes and travelling in consistent paths they were beginning to wear ruts into the haul roads – and that changes were being investigated to add haul road wear as an optimisation constraint. I particularly enjoyed Sam’s comments towards the end of his talk on the recent performance of Rio Tinto and how it is often described as ‘luck’ by many commentators. We have seen a particular confluence of factors: extraordinary growth in an industrialising Asia, high commodity prices and the prodigious production capacity that Rio and our competitors have built over several decades. They have combined to put us in a period of terrific returns on our massive investments yet oddly seem to lend themselves to the perception that it’s all rather fortuitous. It can be frustrating to hear people talk as though we arrived in the Pilbara last year, lucky enough to find both huge ore reserves and thousands of kilometres of rail infrastructure, developed mines, fleets of autonomous trucks and 12,500 highly skilled staff. It’s akin to someone visiting Toyota’s vast plant in Nagoya, taking in the state-of-the-art robotics, finely tuned production process and blistering turnaround time to create a new vehicle and then saying “gee, they can assemble a car in a few hours, that’s a stroke of luck”. All-in-all a informative talk on lean mining management and an enjoyable evening, and a wonderful opportunity to connect with the Australian and New Zealand business community in Tokyo. A special thank you to the ANZCCJ for organising the evening and for sharing the transcript of the talk and photos. Paul Smith is a Director and lean consultant with Shinka Management Pty Ltd, specialising in the transfer of of Japanese lean management know-how to Australian industry. Shinka Management provides lean consulting services focusing on practical, implementable solutions for improving business processes and increasing productivity and competitiveness. 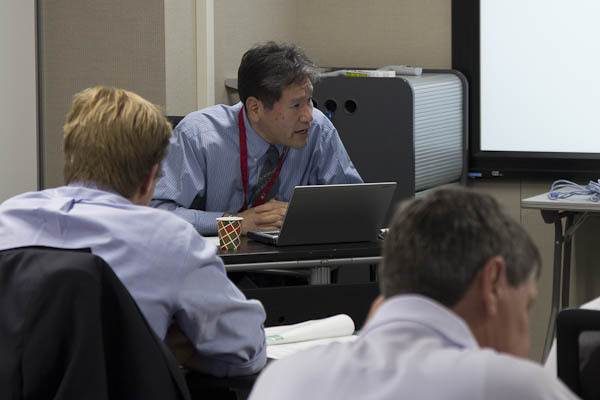 The lean tours have often commenced with a seminar on lean implementation in Japan, presented by JMAC. Learn more about our lean tours to Japan. The Japan Management Association Consultants (JMAC) is one of the world’s leading process innovation consulting firms. It is the oldest, largest and most respected management consulting firm in Japan. JMAC is responsible for creating and implementing many of the lean manufacturing tools and methodologies that are now recognized throughout the world for their levels of quality and productivity. Shigeo Shingo, famous for his significant contribution to the development of the Toyota Production System, was a JMAC consultant. JMAC provides a full range of lean programs from experienced consultants based on teamwork with its clients and genba-focused philosophy. JMAC continues to serve as a driving force behind innovation in industry globally. The Shinka Management Lean Japan Tours actually commenced as the JMAC lean tour run out of Australia, prior to JMAC’s transition to Shinka Management in the region. Each year JMAC provides our tour groups with a presentation focusing on lean implementation in Japan and the latest manufacturing management trends in Japan. These sessions are run by an experienced senior consultant from JMAC’s Production Division, and promotes open discussion and involvement from all participants.